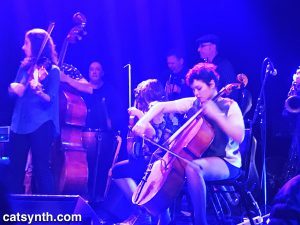 Last weekend the Club Foot Orchestra teamed up with the San Francisco Silent Film Festival, to perform some of their “greatest hits”, contemporary live performances to silent film classics. A full day of live music by the venerable and indefatigable ensemble! 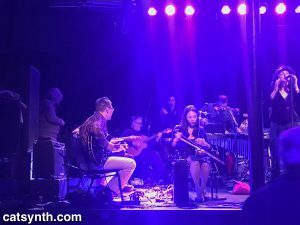 The Club Foot Orchestra was started 25 years ago in 1983 by Richard Marriott (brass, winds), and still includes original member Beth Custer on woodwinds. 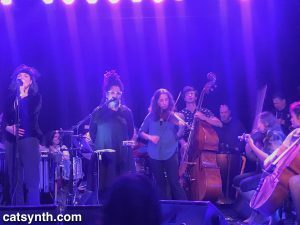 They were joined in this performance by Sheldon Brown (woodwinds), Will Bernard (guitar), Chris Grady (trumpet), Gino Robair (percussion), Kymry Esainko (piano/keyboard), Sascha Jacobsen (bass), Deirdre McClure (conductor), and Alisa Rose (violin). They performed some of their most memorable scores, including interpretations of the German expressionist classics Metropolis and Nosferatu. We at CatSynth were not able to attend Metropolis, Fritz Lang’s futurist masterpiece and a personal favorite of mine. 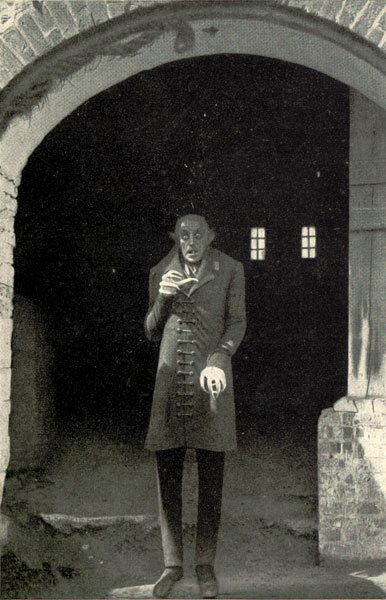 But we were on hand for Nosferatu, the iconic and controversial horror film directed by F. W. Murnau and starring Max Schreck as the eternally creepy Count Orlock. The history of Nosferatu is as intriguing as the film itself. It was an unauthorized adaptation from Bram Stoker’s original Dracula, and although the names and some details were changed, in many ways it conforms more closely to both the story and spirit of the original than many later interpretations. Perhaps too closely, as the Stoker estate successfully sued Murnau’s production company and won a judgment that included an order to destroy all copies of the film. Fortunately, some prints had already been distributed internationally and have been used for restorations of the original. The version screened on this occasion was a beautiful restoration from the 2000s that included color tinting for various scenes. The colors added an even more eerie and otherworldly quality to the film. It worked particularly well for the Transylvanian scenes and those in and around Orlock’s castle. The orchestra delivered a highly dynamic and varied performance paired with the images. There were many sparse sections that fit with the tension of the film, and I particularly liked the spots that featured single lines, such as percussion hits, extended-technique winds, or synthesizer samples. But the sections where the ensemble came together to deliver punchy and sensuous jazz lines were especially fun. It added an element of humor and modernism, which is inevitable for a twenty-first-century viewing of a movie from nearly 100 years ago. The mixture of noises and extended sounds with bits of Eastern European melody and harmony worked especially well for strangely colored Transylvanian scenes. As a small group, each of the wind players had multiple instruments. Richard Marriott had a quite an arsenal of flutes and lower brass, and both Beth Custer and Sheldon Brown had bass clarinets in addition to their other instruments. Gino Robair also had in an impressive array of percussion instruments (though no electronics on this particular occasion). 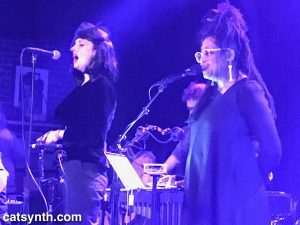 It was a delightful evening of music and visuals that worked well together – a more concrete film-centered version of the discipline we had a seen a week earlier in Andy Puls’ abstract set at the San Francisco Electronic Music Festival. And while I’m sorry to have missed Metropolis on this occasion, Nosferatu was probably even more of an “event” in the space of the Castro Theatre. 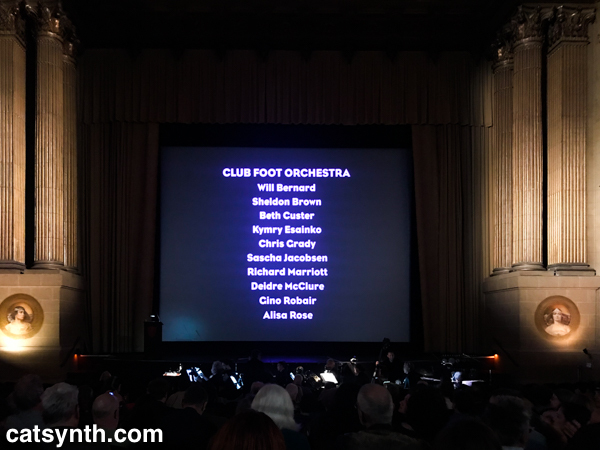 We look forward to hearing more of Club Foot Orchestra’s scores in the near future.